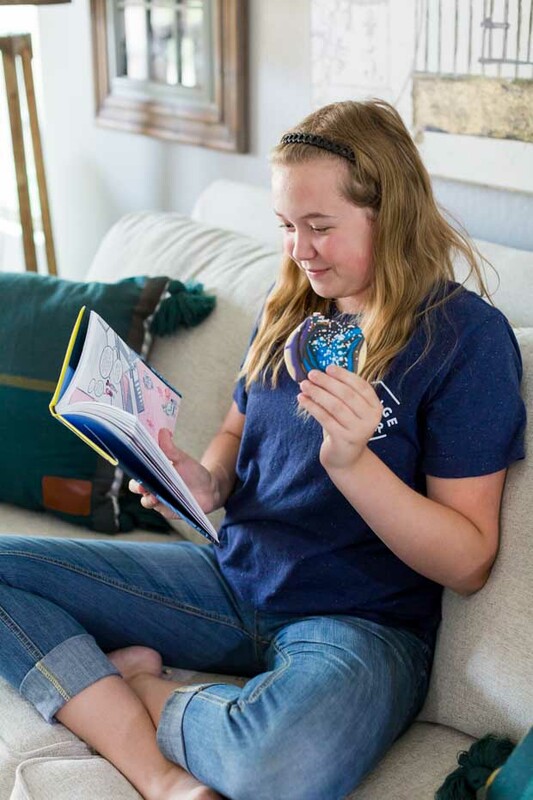 A great book and delicious, homemade galaxy sugar cookies make for a perfect afternoon. This post has been sponsored by Disney Books. Over the last few years, my life has been full of great changes. Ryan and I married and welcomed Rowen and Dax to our family. When Rowen was born, I transitioned from teaching elementary school full time to being a stay at home mom. Even though I’m not in the class room full time anymore, I’m still passionate about teaching and learning — I always will be. These days, I love spending time reading, cooking and doing experiments with the boys. Science projects at the kitchen table are an often requested favorite for us. We’ve always got a lot of projects going on! As the boys grew, I started to pursue a lifelong interest of photography, which grew into a successful business. 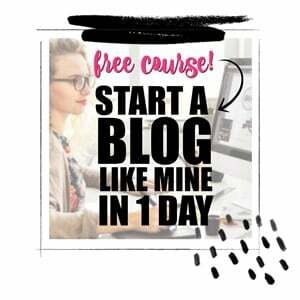 Most recently, I turned my passion for pictures into an online class. It’s been a thrilling and busy venture! Of course, with any season of changes and new challenges, there are always adjustments along the way. Ryan and the boys have been great cheerleaders for me. I couldn’t have done it without all the support and encouragement from my family and those around us. 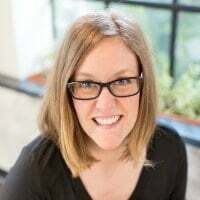 Another source of support is our wonderful middle-grade neighbor, Katie. As life has changed and gotten busier, I’ve been so grateful for her — she comes over and helps with the boys when I’m getting work done. Rowen and Dax love her and the time they spend together. 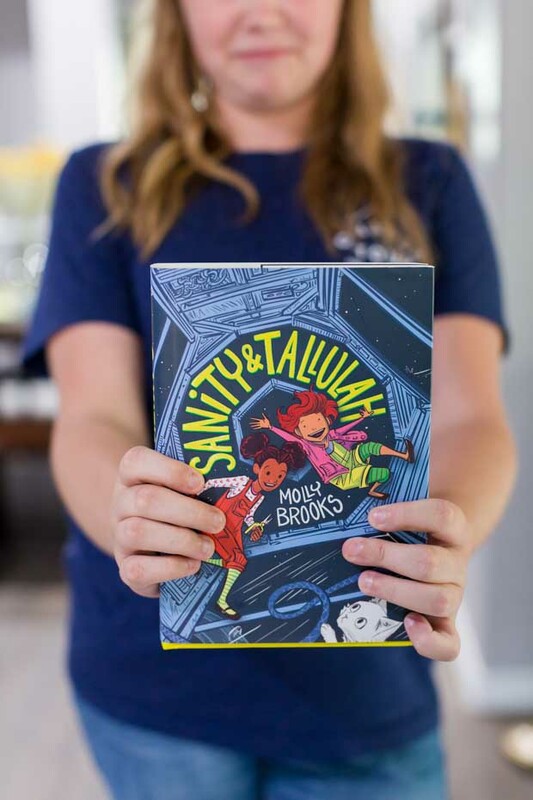 Recently, I learned about the Sanity & Tallulah graphic novel trilogy and I knew immediately who I wanted to share it with: Katie. 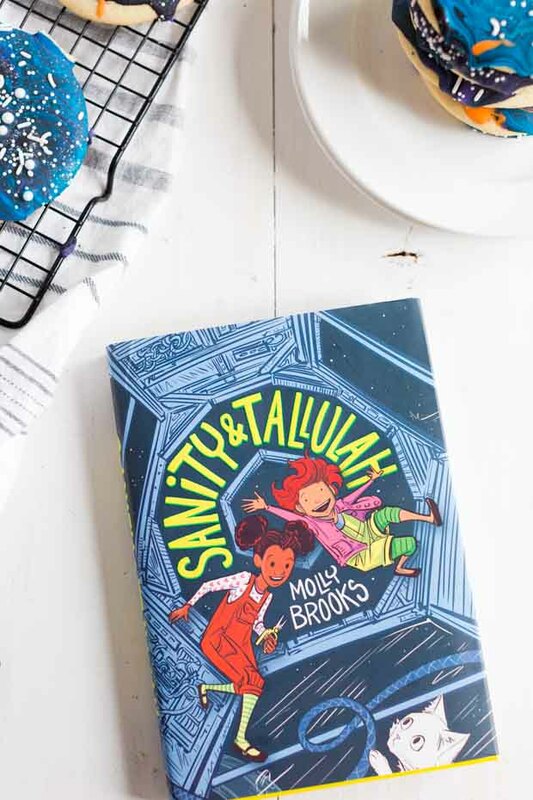 The new series by Molly Brooks follows the irresistible pair of Sanity and Tallulah as they adventure around their outer space home. The books are full of imaginative biology, experimentation, problem solving tech and engineering references. A dream come true for kids who love science plus parents and teachers who are looking for more STEM titles. You’ll discover that this pair of best friends are full of fun and smarts. In this book, gifted scientist Sanity uses her lab skills and energy allowance to create a definitely-illegal-but-impossibly-cute three-headed kitten. Of course, she has to show Tallulah. But Princess, Sparkle and Destroyer of Worlds are a bit of a handful and it isn’t long before the kitten escapes to wreak havoc on the space station. The girls will have to turn Wilnick upside down to find her, but not before causing the whole place to evacuate! Once I got my hands on the first book, I couldn’t wait for Katie to come over. 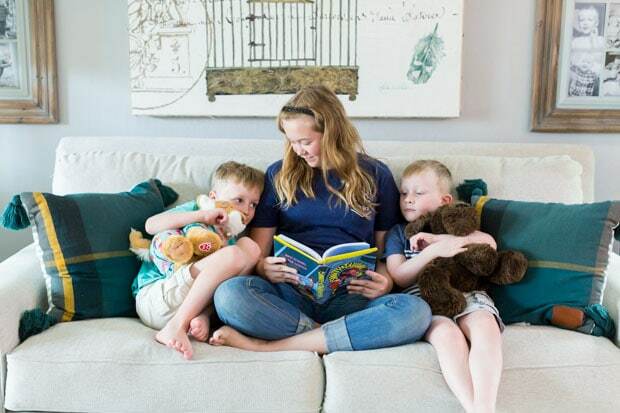 I knew she would enjoy the book herself and the boys would be happy to snuggle and read. I was right! They all curled up on the sofa, happy to be together. Of course, a great book needs a great snack. 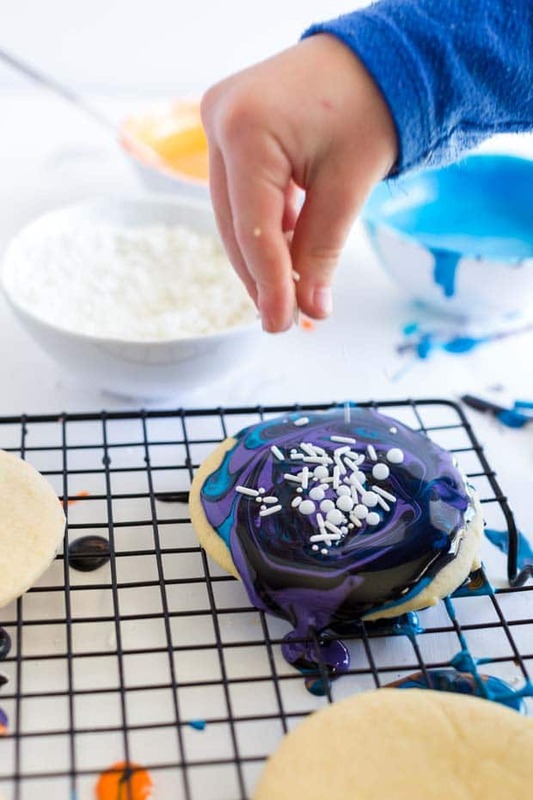 That’s where these yummy galaxy themed sugar cookies come in. They’re a fun, easy treat made from scratch that your crew will love. And they’re the perfect compliment to the outer space theme we find in the Sanity and Tallulah book. Let’s get started! In a large bowl, cream together butter and sugars until creamy. Then add egg and vanilla, mix until smooth. In a separate bowl, sift together dry ingredients and gradually add to the wet ingredients, a third at a time. Mix until the dough starts to come together. Cover and refrigerate for 30-40 minutes. Roll dough out to be ¼ inch thick. Use a large round cookie cutter to cut out circles. Place cut outs on a baking sheet lined with parchment paper. Bake for 8-9 minutes at 375 degrees. When cookies are done, let sit for 1-2 minutes before moving to a cooling rack. Allow to cool completely before frosting and decorating. Not only are these warm, soft cookies the best — the homemade royal icing takes them over the top. 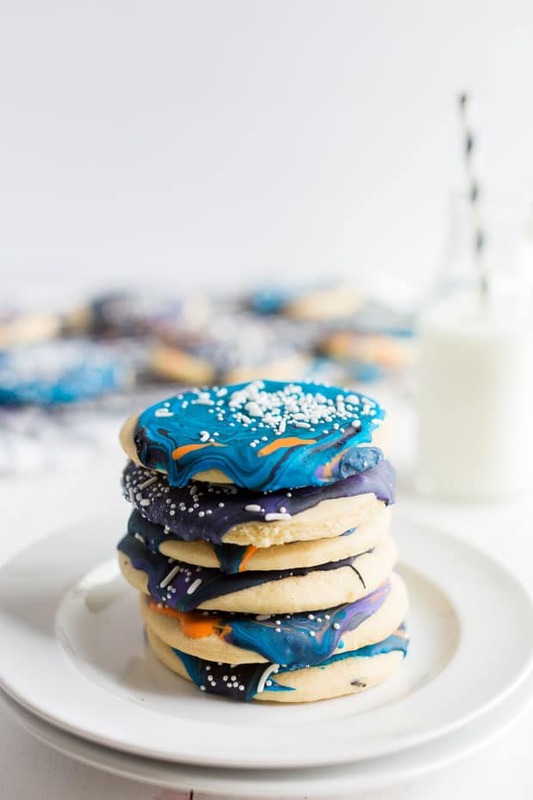 orange, purple, blue and black professional grade food coloring — you can find these in the cake decorating aisle at craft stores. white sprinkles — I purchased four individual packs of white sprinkles from a craft store to make my mix. You can add royal icing to soooo many baked treats. Once you’ve made this recipe, you’ll want to make it again and again! In a stand mixer, fitted with a whisk attachment, combine powdered sugar and meringue powder. Add vanilla and turn the mixer on low. Slowly add the water and mix on low until all of the powdered sugar has mixed into the water. Then turn on high and beat until the frosting starts to thicken and increase in size. Turn off the mixer and lift the whisk out of the frosting. The frosting should flow like ribbons back down into the bowl. If it’s too stiff, add more water. Divide the frosting into four separate bowls and color each of them a different color. When the cookies have cooled, add a little bit of each color of frosting to the cookie. (If the frosting has thickened from sitting, just add a little more water, a teaspoon at a time). Use a toothpick to gently swirl the frosting. (I told my kids, swirl, don’t mix!) Then add sprinkles on top. 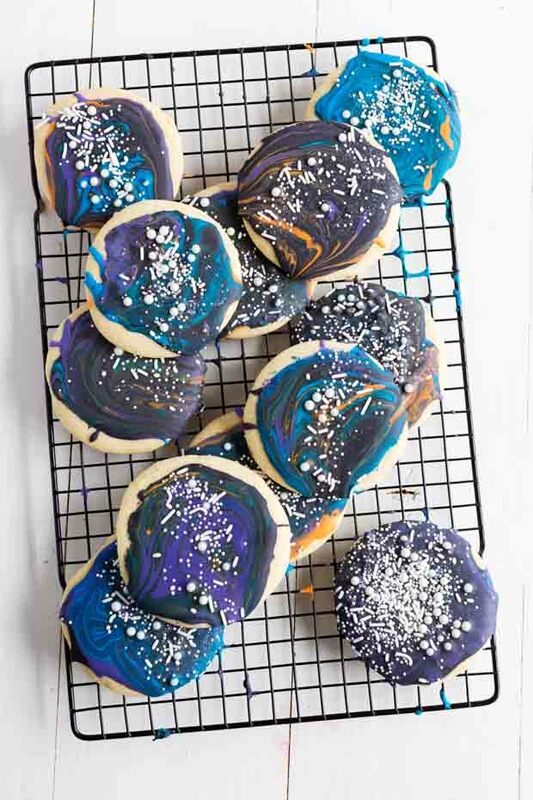 So a couple of notes for these galaxy sugar cookies. You can use a toothpick to swirl the frosting together, or if you’re making these to keep around the house and not share with others, make it fun and cut a paper straw in half and let the kids “blow” the frosting around the cookie. Everyone loved munching on their homemade sugar cookies! I’m confident your gang will love these sugar cookies plus reading the adventures of Sanity and Tallulah! Enjoy! 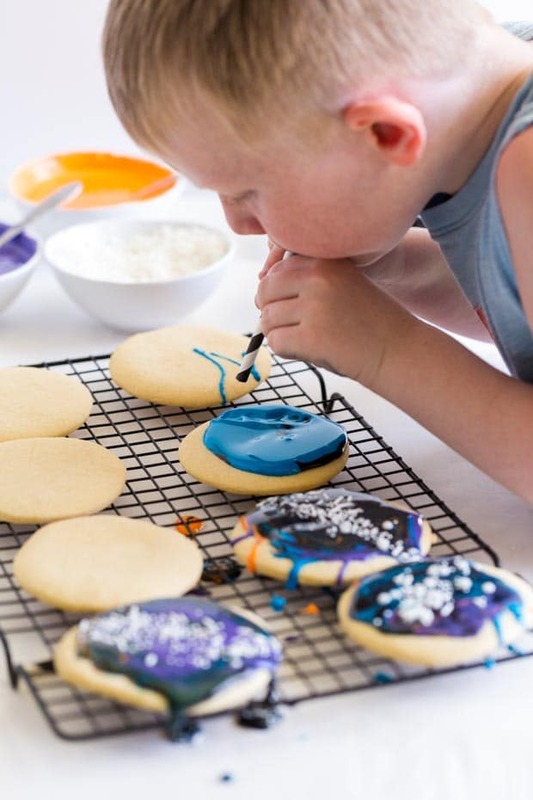 These fun and simple sugar cookies are the perfect sweet treat! Take half the dough and turn out onto a clean and well floured surface. Bake for 8-9 minutes at 375. This simple, homemade recipe is so easy and tasty! Previous Post: « [Boy/Girl Party] Little Prince Book Birthday Party! thanks for this ideas.. my kids my loves cookies! Super fun with great taste!